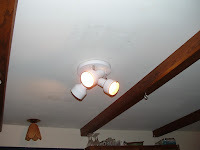 Here is a picture of the new light fixture we put into the kitchen. This makes it the first of the home improvement projects. Coming up is the new kitchen sink.